But its definitely not a sows ear! This new version is most definitely a pretty, lacy crown to a hat! 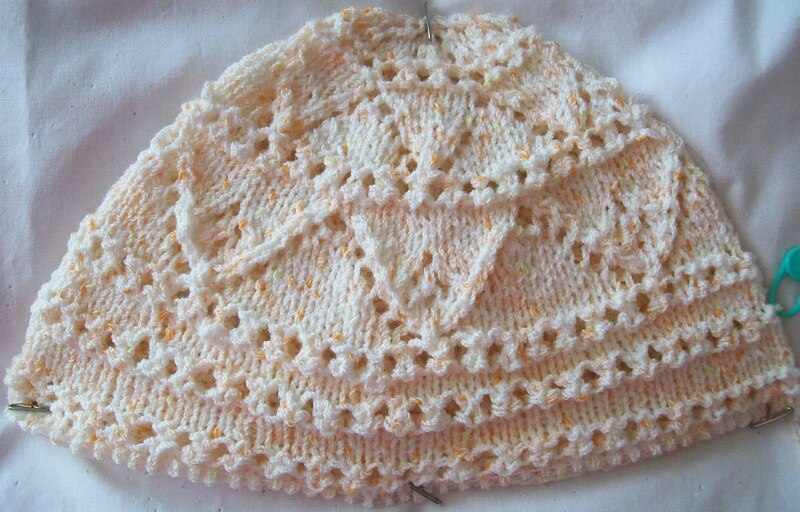 The yarn is a not too soft (and not at all silky) blend of acrylic and rayon—and while peachy bits predominate (it looks peachy doesn't it? ) there are scattered bits of lime green, too, in the white background. They are harder to see, but there, all the same. I am so glad I frogged and started again! And gladder still that I have been documenting the pattern. This version of the crown is a 1000 times nicer than the first, isn't it? —It's simple (well, I think its simple), because it is VERY REGULAR--make a INCREASE? (YO)/Make a DECREASE (either a K2tog or a SSK). The YO's are, for the most part, very closely paired to the decreases. This is regular pairing of increases and decreases is a big factor in a making a lace easy to knit, in my opinion. OK, OK, there are a few rounds where there are some YO and NO matching decreases --but –I've been keeping track of the stitch count in each round--(an other detail I like to find in a pattern). So you know before you knit a stitch in these rounds—INCREASES be here. There are just a few rounds--(in the Beading pattern, mostly) that pair lace (YO/and decreases) with an INCREASE (a YO and NO decrease). I don't think it's too hard (and remember, I am designing it as I knit it!) a pattern to knit –It is positively easy if you are skilled at reading your knitting. There is nothing extremely original about the pattern (pointed petal like motifs) –but the way they are laid out is totally original—and (this sounds scary if you don't knit a lot of lace)--every other round is a new set of instructions—even when there are no increases involved. For the most part, alternate rounds are your basic Knit every stitch. But—just to be interesting—this is generally, but not completely true. Sometimes, there are 2 pattern rows together, and sometimes 2 plain rows together. Still-- there are only 50 rounds or so in the crown and about half are plain knitting. Then a few inches of very simple knitting till the brim. At that point—the increases for the crown are finished, and it's easy street for twenty something rounds or so. I got to that point last night—a good thing too-- since my brain was down shifting into low gear. It's a pretty common feature of a hat –start with X, increase till its Y (inches or stitches depending on the pattern) then continue working even (a tube) till the hat is deep enough. I like a deep hat—one that covers most of my bowling ball head-- but there will be an option or a shallower version--(the last set of increases can also be eliminated for smaller heads too)—and some invisible increases (to correct the count for the brim) worked into the first round or 2 of the brim. It looks deep enough now, on HEAD-but HEAD is a scant 19 inches--and my head almost 22. 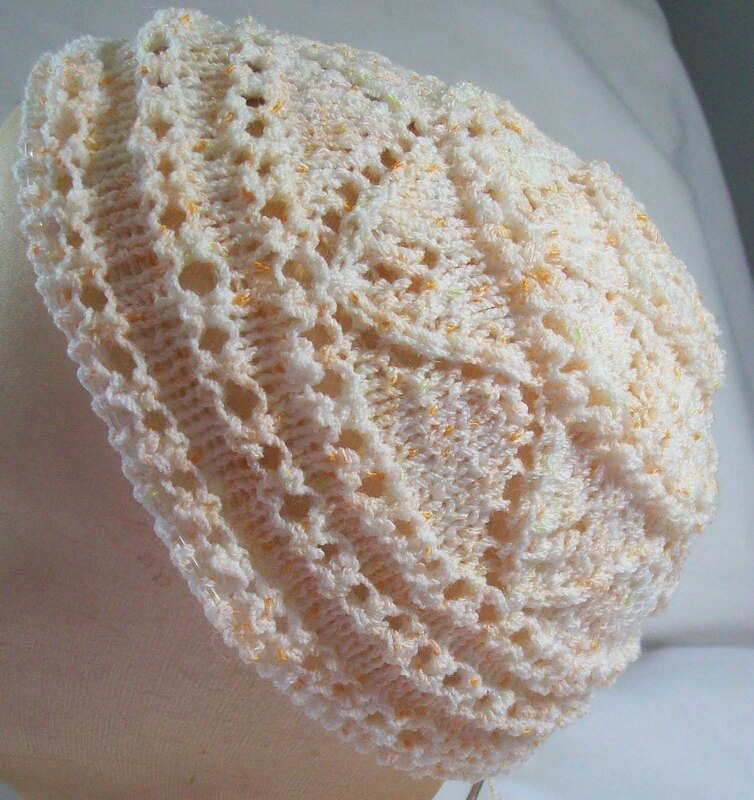 The brim will be narrow—One problem I have with the Lacy blue hat—is the broad brim (even though its very open and lacy) catches the wind—The hat wants to become a Frisbee! This hat will have a narrower brim (maybe 20 rounds in all) and should be less prone to want to take flight! I love this kind of knitting—making up patterns as I go—In some ways it's simpler design than I first envisioned—in other ways—more complex—some increase rounds are a few as 4 stitches, many are 6, some are 8, one is 10! My calculator is at hand—and in constant use. I know some knitters claim to hate math (not me!). To me, it's like a puzzle—How many stitches do I have? How many do I need? -Where can I get (make!) more—with out messing up the basic symmetry of the design? --How many do I need to keep the hat flat –but not too flat (a hat needs to cup a bit). It is a play between pattern and gauge, form and function.. Math as a magic wand that makes it work. Yes, it looks like Peaches and Creme. Very lovely color. So, this is a hat that has a spring form for the brim? I'll keep watching as you finish it.